I'm a Midwesterner, despite having been born in the so-called Garden State. I grew up in Illinois, the land of the casserole, the hot dish, the Jell-o salad, the taco pizza, and a lot of of other things people on either coast might find unsavory or unhealthy. So, sue me. 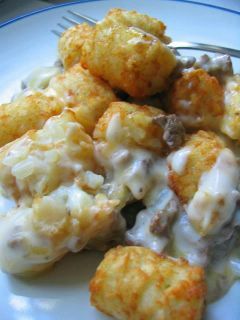 The basic Tater Tot Casserole recipe is a four-ingredient masterpiece that can be accomplished by a grade schooler: spread a pound of ground beef in the bottom of a 9x13 dish and cover it with tater tots and a mixture of cream of mushroom (or chicken) soup and milk. Depending on whether or not you've already browned the meat, you cook it for 30-60 minutes on 350F. Then, you serve it with nice healthy veggies and a piece of fruit for dessert. (So you can pretend you're being virtuous.) Yum. Tater Tot Casserole. Maybe not so good for you, but damn tasty in a very Midwestern way! Tator Tot Bake!! You are making my mouth water! I now live in the health crazed SF Bay Area but I'm also a midwest gal (Joliet, Il)and you just can't take the cooking out of us, can you? Last night I had a real craving for my mom's bean soup. So I grab a bag of Great Northern bean and commenced cooking. Well it was almost my mom's bean soup - no ham bone available so I bought some smoked turkey legs. Yum, Yum, Double Yum! P.S. I've been reading your blog for a few weeks now and I really adore the way you write. I keep interupting my partner's tv viewing with "Listen to this" as I read something you wrote. I predict that any day now he will ask me to send him your url! Oh man! Great Northern Bean soup with ham!!! YUM! Best eaten with a big, crusty piece of buttered Italian bread. A woman after my own heart!